It’s so hard to believe that baby J is 1 year old!! I think back to the day that he was born and remember it like it was just a few weeks ago. I remember going into the hospital the night before he was born to be monitored, and to experiment with the best way to induce so we could meet baby J the next day! I remember being so nervous about how it was all going to happen, and if I was going to be able to have a natural birth like I wanted. I was so overwhelmed the day baby J was born; overwhelmed with intense contractions, anxiousness on how it was all going to go, fatigue, and extreme joy. I wouldn’t have done it any other way. I was able to experience how everything felt and how powerful God is, while acknowledging that God made me and created the birthing process. I prayed a lot between contractions. I knew He was right there with my birthing team. My birth story is a testament to how doulas and/or midwives can help a natural birth happen with love and support and without trauma and drama. Everyone on my birthing team played a major role that day in helping me meet my adorable son. After about seven hours of true labor, baby J came into the world. I remember feeling relieved and amazed and awed all at the same time. It’s a baby! It’s my baby! And he is cute! I don’t know if anything or anyone can prepare you for what it is like to take a newborn home. It’s entirely nerve-wracking and exhausting. My baby boy was a difficult newborn. He cried a LOT. I remember barely getting any sleep. At the time, I remembered reading advice from other new moms before I had baby J, and there was one piece of advice that was repeated a lot. Don’t be afraid to ask for help and when someone offers to help say yes every time! I did exactly that. My mom came and stayed with us for 9 days and then my best friend Sarah came and stayed for 4 days. I asked both of them if they could pull a night duty with Jacob, and just bring him to me to nurse when he was hungry. The church delivered meals every few days so I didn’t have to cook! I didn’t really socialize much those first 2-4 weeks. The baby blues had taken me over. I fed Jacob, fed myself, and showered. If I wasn’t doing those things I was sleeping. I am so grateful for the help from my friends and family those first few weeks. I love and cherish each day with my baby boy. God has truly blessed our family. I have an amazing husband who I am in love with and the sweetest baby boy! And my golden retriever Suzy. She’s the best dog, and I can’t forget her! She lets baby J crawl all over her and pull her hair, and she loves it. Our whole little family has been sick this week. I started the head cold fun at the end of last week so I had some of the weekend to feel miserable. Chase got it one day after me, and baby J got it one day after him. So I can kind of guess how Baby J feels today. He probably feels around the same way I felt two days ago. At least two days ago is when I started feeling better! And of course we all had to get this stuffy snotty head cold a week before baby J’s 1st birthday party. But I know everything will be great. We are all feeling better and there are still two days between us and the party! TWO days!! I have been preparing mentally for this party for several weeks now. I made sure I had everything bought and mentally thought out weeks ago. And now I am SO glad that I did not put it off. I wouldn’t have been able to think through anything this past week. My brain was either on cold medicine, or I had a sinus headache. So now that I am thinking clearly, I am getting really excited! We have a lot of family coming this weekend and I can’t wait to celebrate my baby boy’s birthday! 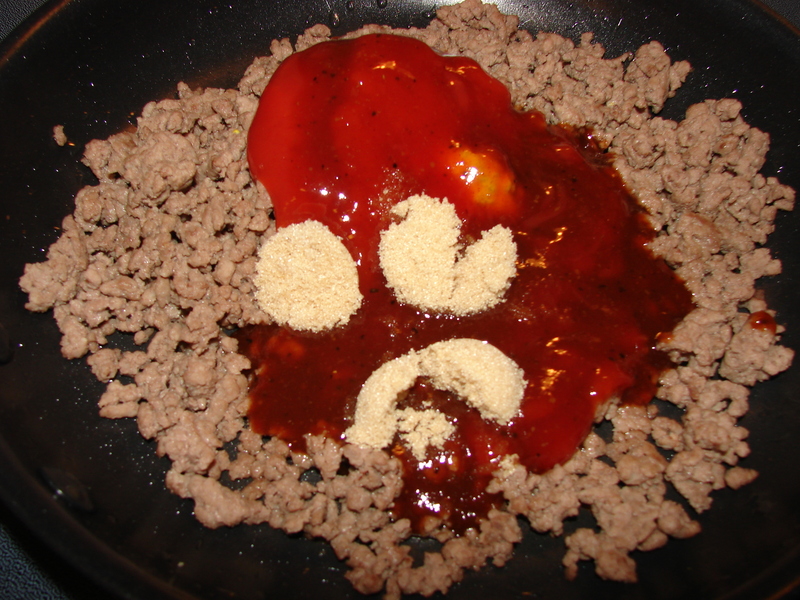 I love making sloppy joes for dinner. They are so easy to make and I make them from scratch with ingredients I always have on hand. If I don’t have anything planned for dinner, this is so easy, and it only takes about 10 minutes to prepare and 30 minutes to simmer. All you need is a pound of ground beef and some hamburger buns. You probably have all the other ingredients in your pantry or fridge already! Start out by browning the ground beef. Add whatever seasonings you would like to the meat. I am a fan of Nature’s Seasoning. 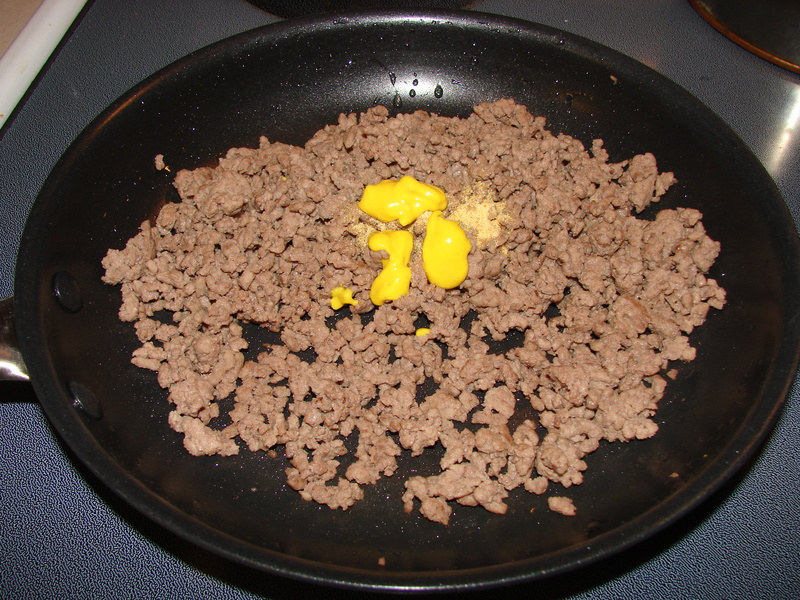 You can use salt and pepper, and if you would like, add in onions and green peppers to the ground beef. I choose not to because I am not a fan of onions and green peppers so I rarely have them around. Drain the grease from the pan. Add garlic powder, yellow mustard, barbecue sauce, ketchup, and brown sugar. Mix thoroughly and bring it to a good “sizzle”. As soon as you hear that sizzling sound, reduce heat to simmer. I usually keep it on the lowest heat possible. Simmer for 30 minutes occasionally mixing. This gives you just enough time to make french fries, a salad, or whatever side you would like to make. Just recently I tried tomato with my sloppy joe and I loved it! Experiment! 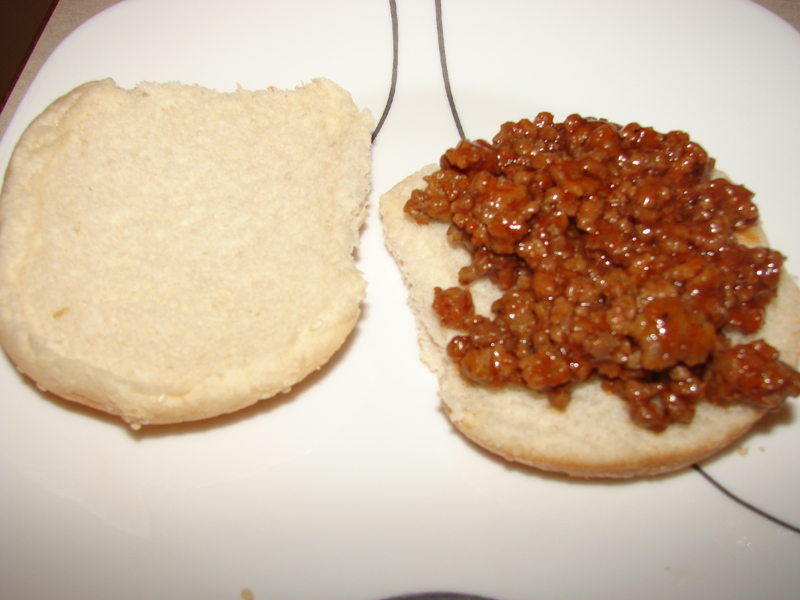 Love these sloppy joes!! And you can make them taste slightly different each time depending on what barbecue sauce you use. 1. 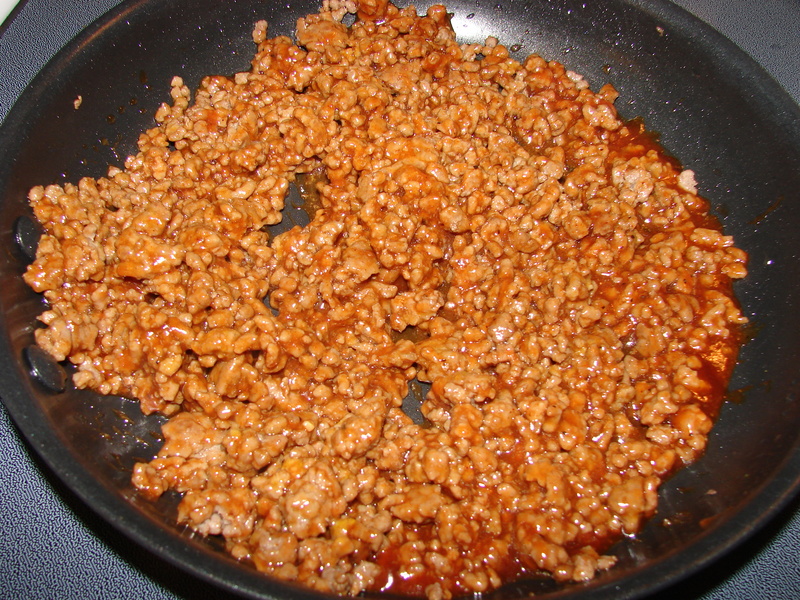 In a medium skillet over medium heat, brown the ground beef and seasonings together. Add the onion and green pepper if you would like. Drain. 2. Add the garlic powder, mustard, barbecue sauce, ketchup, and brown sugar, and mix thoroughly. Heat until you hear a nice sizzle, and reduce heat to simmer. Simmer for 30 minutes. I love Valentine’s Day! It’s the best excuse to spread some extra love around to people you know and people you don’t know! Maybe it’s because red roses are my favorite flower, but I have always loved this holiday. 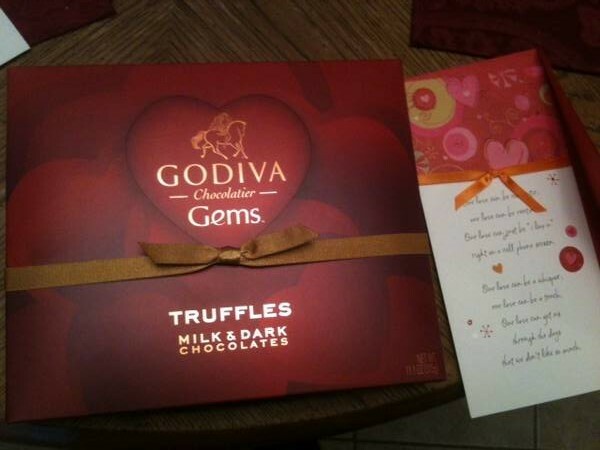 This year I asked my husband to only buy me Godiva Chocolates. I wanted any money spent on me to go towards chocolate instead of flowers. Haha!! I love getting flowers, and Chase surprises me with flowers occasionally which I adore! One thing about Valentine’s Day that isn’t so great is that the cost of flowers (especially roses) are so expensive! I am not sure why roses are the thing to give for Valentine’s Day when this isn’t even the season for them! They have to all be shipped in from somewhere else where they are actually growing, and with demand extremely high, the prices are crazy! Well, enough of my rambling! I will leave you with a picture of what Chase gave me for Valentine’s Day. I am enjoying them thoroughly! If you are one of those people who buy jello in individual snack pack sizes then listen up! 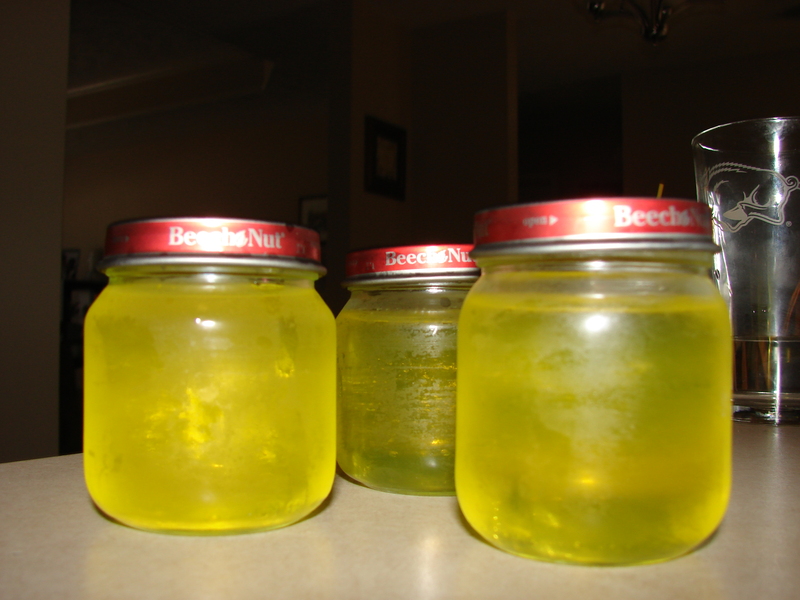 You can save money by buying jello in a box and make your own with baby food jars. 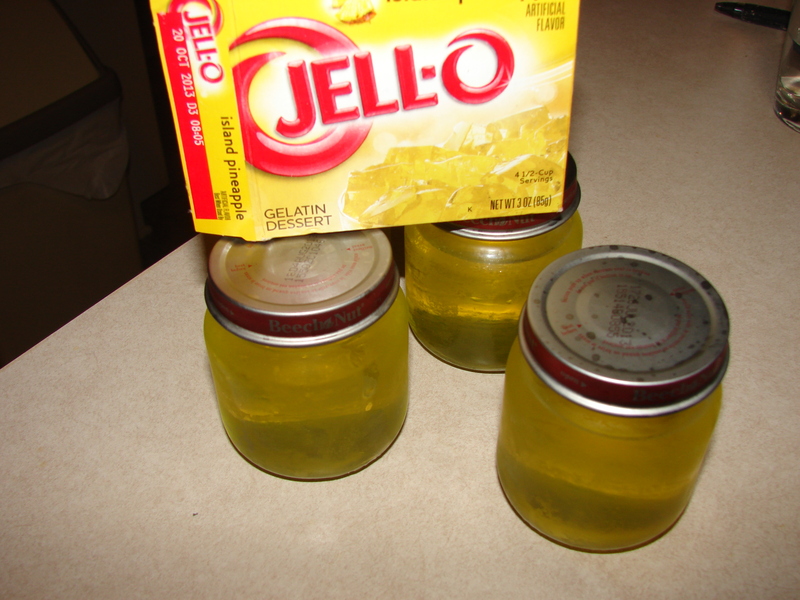 The lids help keep the jello fresh, and it is super easy to take to work and on the go! I kept one jar in the fridge for 8 days and it still tasted and looked as fresh as the day I made it. I decided to use my newly clean and sticker free baby food jars for individual servings of jello! Normally you would pay around $1 or a little more for a 4 pack of individual servings. That is about 25 cents each. If you use a small box of jello it makes 5 baby food jars full of jello. The cost for these are around 16 cents each and 8 cents each if you buy the off brand jello. Woo Hoo! Now you may be asking why you should care about saving a few extra pennies? Well for me I love it because I can make any flavor I want, add fruit, or think of anything! From now on I will be buying jello I can make myself. I found these super convenient. I even liked to eat these at home because I could just pick up a jar and a spoon. No dipping from a big bowl of jello! And didn’t someone say once that a penny saved is a penny earned? I only had one grandpa growing up; my mom’s dad. My dad’s dad passed away when he was just a little boy. My one and only grandpa passed away in October of 2010. It’s hard to believe it’s been over a year ago. It makes me sad that baby J never got to meet him. Sometimes I think about my grandparents as they were, but then I remember that things are different. They no longer live together in the house they lived in for over 50 years. I can’t go visit that house and swing on their patio swing in the back and snap beans. I can’t run around their one acre of land. (Not that anyone ever got to run around on the back 1/2 acre!) I can’t climb the tree in the front yard anymore or help the younger kids climb the tree (unless I want to get shooed off the property by the current owners). I don’t receive fresh pecans anymore as a Christmas present. Some years they picked a ton of pecans. Now I have to buy them and I can’t believe how expensive they are! I can’t look at the different walls in the house and the different furniture and remember all the memories attached to them: Sitting in front of the heater changing my clothes as a kid (they didn’t have central heat and air until I was around 20). Sitting in front of the tv with my brother and/or cousins on a blanket. We had to sit on a blanket so we could eat food in the living room. Sometimes Grandma would pop corn, (using an actual corn popper!) and when she would pour the butter on, it was amazing! Other times we would eat ice cream or something else messy, but as long as we stayed on the blanket! I remember they had this children’s book about Paul Bunyan. I think that is the only time I ever read about him or heard of him. The reality is my grandma lives in an apartment and the house has been sold. I miss that house and my grandpa. Sometimes I see little things everywhere that remind me of my grandpa. A hat in the back window of a car or different color blazers, brown, blue, grey, etc, from the 70/80s maybe even 60s! When I see an old man mowing his grass, especially on a riding lawn mower, I think of how much Grandpa loved mowing his one acre of land. I think he took great pride owning and maintaining his land. Not many people own that much land, even today! Almost every time I eat KFC, especially if I have it for Sunday lunch. I remember that we always had KFC for lunch after church at my grandparents house. We always had the mashed potatoes and gravy and coleslaw as sides, and every time they would exclaim that they couldn’t believe I didn’t like coleslaw and I didn’t know what I was missing. If I ever get antsy to leave a store I remember that is how my grandpa was EVERY day. He was always ready to get to the next place before everyone else was. His favorite place may have been his home. I know he his in his absolute favorite place now, and he never has to be in a hurry to get to the next place so he can finally be home. And as a final note, I must say my Grandma is one great Grandma!! I’m so glad I have one grandparent left and I hope she is around for a while for baby J to know her. We had a special Future Disciples service honoring the babies born in 2011 at our church a few weeks ago. They do this once a year for all the babies born the year before. The parents have a chance to write something to their child that is read to everyone. I wanted to share what we wrote for baby J.
J, you are the perfect addition to our family. We love you so much already. It’s amazing to think about how much more we will love you as you grow. You gave us a great Christmas present when you started to walk a couple of days before Christmas. You surprise us and make us proud on a regular basis. We love seeing all the new things you can do, and how you really concentrate to learn and understand something. You are the happiest little boy! We love to hear you laugh many times every day. We are so blessed. God answered our prayers before you were even born by keeping you safe and healthy. We pray that you will always see us walking in Faith and setting the best example possible for you, and by that example you may know God and love Him with all of your heart.